Biofact — Danielle Townsend Design Graphic Design and Brand Identity Design Dublin, Danielle Townsend Design is a Graphic Design and Visual Thinking agency based in Dublin. 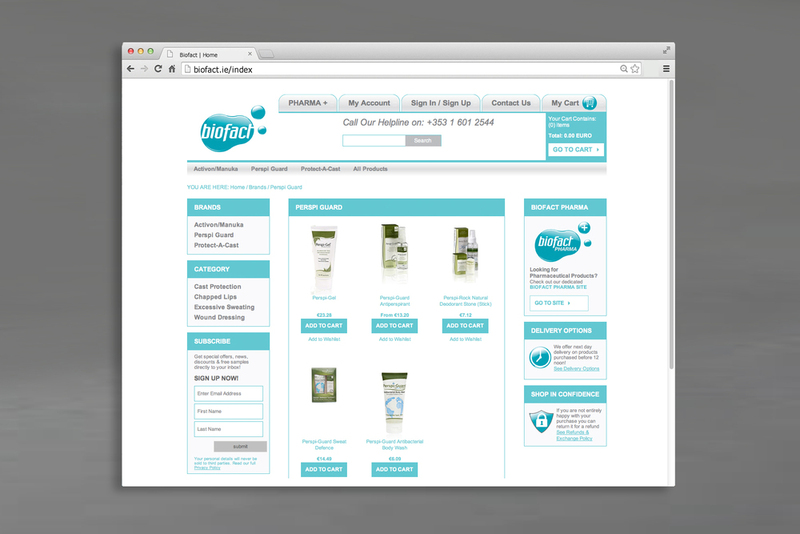 Biofact sell and distribute a range of pharmaceutical and cosmetic products in the Irish market. The main target market is the female market who want products that are affordable and effective. An easy to use, purchase from and update site was paramount to the brief. The solution was to create a user interface that is simple to navigate and purchase the products. The layout is based on a strong grid system and large navigation links. The site is also built with a 'What You See is What You Get' content management system which is developed to be easy to update and manage. A database of subscribers also collects in the backend and with a simple click can be exported for use in mailing systems. Customers also can login and crete accounts to manage and track orders.